CTMH Artfully Sent Cricut cartridge. 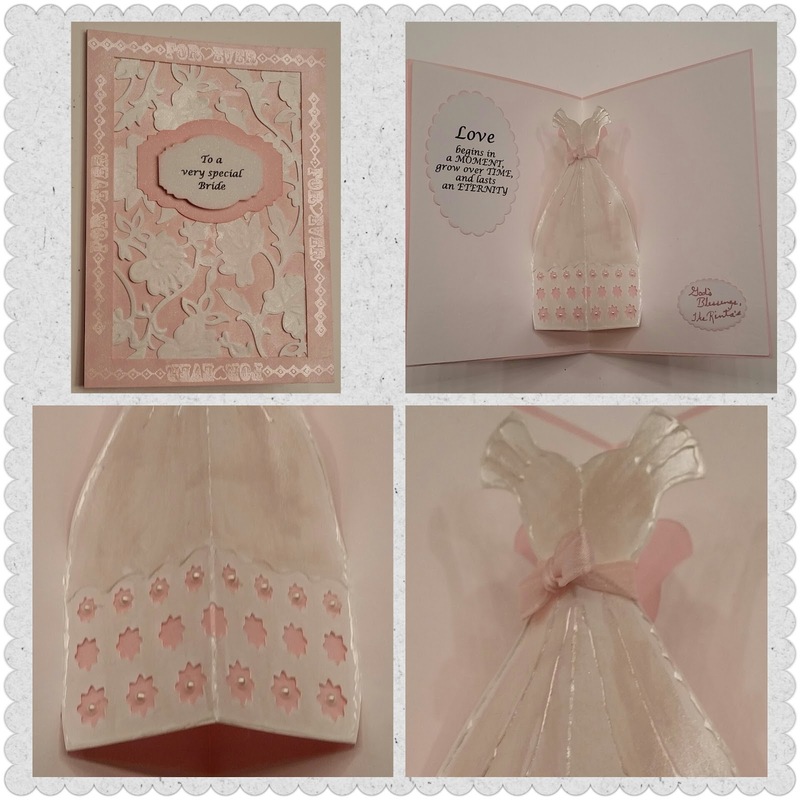 This card is from the CTMH Artfully Sent Cricut cartridge....but the front was decorated with the Cricut Cuttlebug Flower Bramble Cut & Emboss die, and the label was cut using Sizzix Majestic Label dies. The labels on the inside were cut using Sizzix Scalloped Ovals. The gown was "painted" with Perfect Pearls and embelished with adhesive pearls, and a ribbon tied around the waist. This has become my "go to" card for brides. There are many amazing cards on the CTMH Artfully Sent Cricut cartridge, and they are all easy to make. You can make them exactly how the cartridge shows, or you can improvise and make your own creations like I did. The front was decorated with the Cricut Cuttlebug Flower Bramble Cut & Emboss die, and the label was cut using Sizzix Majestic Label dies. The labels on the inside were cut using Sizzix Scalloped Ovals. This is such a beautiful wedding card. I love all the pearls and details. Thanks for joining us at bbtb2. Bee-utiful Bride card indeed. Just came from Bitten by the Bug 2 where you were announced as winner of the Wdding or Anniv Ch. I've not made this before and will give it a try. Beautiful wedding project! Gorgeous details! Congrats on your win at BBTB2!